*5 year warranty replacement on this LED light (or LED bulbs for light fixtures with removable LED bulbs). After 30 days, the customer ships the failed LED light and/or LED bulb to Larson Electronics at their expense. If the failure is a manufacturer defect, we will ship a new replacement to the customer. If failure occurs within 30 days of receipt, Larson Electronics will provide a return label via email to the customer. When the failed light is returned, Larson Electronics will ship a new replacement. Please click here to see our 5 Year Warranty pamphlet. The Larson Electronics HAL-48-2L-LED-DNMS Hazardous Area LED Light Fixture features a Motion + Day/Night Sensor and is U.S./Canada approved for Class 1 Division 2 Groups A, B, C and D, UL 1598A listed, and ideal for hazardous locations where flammable chemical/petrochemical vapors may be occasionally encountered. This hazardous location LED light has a T4 temperature rating and carries a United States Coast Guard approval, making it ideal for applications such as oil rigs, ships, offshore applications, petrochemical, manufacturing, chemical storage, and water treatment centers. 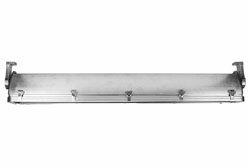 This four foot long, two lamp LED fixture is ideal for operators seeking a top quality hazardous location light that will reduce operating costs, improve lighting quality and reduce downtime incurred from frequent servicing intervals. 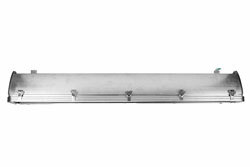 The HAL-48-2L-LED-DNMS fixture is listed Class 1 Division 2 Groups A, B, C and D hazardous area LED light that takes the reliability and efficiency of a fluorescent fixture and adds even longer lamp life and efficiency with high output LEDs. This fixture is T4A temperature rated and comes standard with our high power 28 watt LED lamps. The lamps are protected by an aluminum framed shatter and heat resistant clear acrylic lens secured with ten draw latches and the fixture is constructed of copper free aluminum alloy. The lamp reflector is corrosion resistant heavy gauge aluminum and coated with a high gloss reflective finish. This fixture carries a T4A temperature rating and is U.L. 595 and UL 1598A Marine Type approved for use marine environments. The HAL-48-2L-LED-DNMS is weatherproof and provides operators in hazardous locations with a highly efficient, reliable and affordable lighting solution for open areas where flammable chemicals and vapors may occasionally be present. Click here to read the NEC description for explosion proof and hazardous locations. Sensor Technology: The HAL-48-2L-LED-DNMS is equipped with an innovative and powerful day/night + motion sensor. 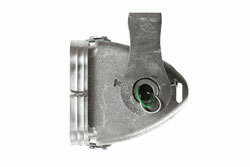 This sensor, which is located inside the light fixture itself, allows the HAL-48-2L-LED-DNMS to operate in one of several different and versatile modes. This LED light fixture can be set to be motion activated, day/night activated or in a combination of motion sensing and day/night modes. This high-tech sensor is also highly adjustable and allows operators to modify the following settings: motion sensor sensitivity, motion sensor time-delay and the intensity output level of the fixture. Having this degree of flexibility in operation and settings offers operators an incredibly versatile light fixture. Sensor Versatility: The impressive versatility of the motion + day/night sensor found in the HAL-48-2L-LED-DNMS LED light fixture allows for a lot of creativity in the setup of a single one of these light fixtures. However, the versatility is further increased when multiple units are to be installed together such as in a parking garage or other similar structure. Operators can take advantage of the sensor versatility to set up an energy efficient and automated lighting setup. Take a parking garage for example. Operators would be able to set up a sequence of HAL-48-2L-LED-DNMS fixtures with alternating lights on seperate circuits. The first circuit would have sensors set to a lower lux level than the fixtures on the second circuit. This hypothetical setup would allow half the lights to come on as daylight began to fade and the rest of the lights would only come on once complete darkness had fallen. The fixtures could then be adjusted for motion sensing which would allow selected fixtures to power on when pedestrian or vehicle movement was detected and then turn off after an operator chosen interval to conserve energy. This is just one example of the flexibility and versatility that can be achieved with the HAL-48-2L-LED-DNMS . The 28 watt LED lamps produce 30% more illumination than standard T8 bulbs while offering lower amp draw and increased reliability. Each lamp produces 3,500 lumens at 125 lumens per watt, for a combined 7,000 total lumen light output. An HAL-48-2L-T8 hazardous location fluorescent light, with a combined total of 64 watts, draws 0.54 amps at 120 volts AC. This LED version of the same light, with a total of 56 watts, draws only 0.47 amps at 120 volts AC. This results in a lower amp draw while still providing increased reliability and light output. The HAL-48-2L-LED-DNMS is universal voltage, not multi-tap, and operates on any voltage from 120V to 277V AC 50/60hz without any modifications. The internal LED driver is a "smart" driver, sensing the incoming voltage and adjusting accordingly to provide the current required by the lamp. This allows operators to simply wire the fixture to voltage within the 120-277V range, no modifications required. This includes commonly found voltages such as 120V 60Hz, 220V 50Hz, 240V 60Hz, and 277V 60Hz. We also offer a 12/24V AC/DC version for low voltage applications for AC or DC power. Low voltage fixtures require no modifications between 12V and 24V power sources, nor between alternating and direct current supply. Suspension Mounting: Pendant mount fixtures hang from the ceiling and are suspended by rigid pipe. Each fixture is equipped with two 3/4” NPT hubs, one on each end of the fixture. Operators bring rigid pipe down to the threaded mounting hubs. Wiring is fed down through the rigid pipe to one of the NPT hubs and tied in to the fixture’s lead wires, completing the electrical connection. The remaining pendant hub provides support for the opposite end of the fixture. Suggested Applications: Aircraft maintenance, oil drilling rigs, refineries, marine and salt water environments, ships, tankers, offshore, solvent and cleaning areas, gas processing plants, chemical manufacturing, waste treatment plants, gas processing plants. 7. 3/4 inch, threaded access hole for wiring conduit on both ends of the fixture. Pendant mount fixtures have access holes on ends and back side of fixture. 8. Both surface or pendant mount units can be wired end to end in series. 1. 50,000 hour lifespan.